What could your community do with a million dollars? In Granite Falls, it isn’t a hypothetical question. In November 2017, the Granite Falls Area Community Foundation received $1.2 million from the Bush Foundation to honor Archibald Bush’s legacy in his hometown. Most of the gift — $1 million — established the Archibald Bush Endowment Fund, which will serve the community for the long term. 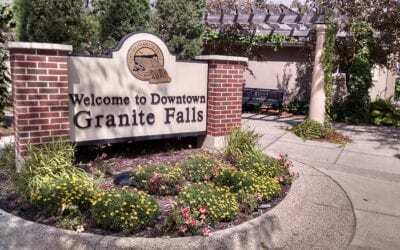 Another $200,000 will help address immediate needs in Granite Falls. In addition, Wallin Education Partners, a Minnesota-based scholarship organization, received $600,000 from Bush Foundation to assist Granite Falls area students pursuing post-secondary education. This major investment honors Archie Bush’s love for his hometown. Born and raised in Granite Falls, Bush dropped out of school in eighth grade to work on the family farm. In 1909, he joined Minnesota Mining and Manufacturing (3M) as a bookkeeper for a salary of $11.55 per week. Together with William McKnight, Archie helped transform that little company into one of the largest and most innovative companies in the world: 3M. Bush rose up to become the company’s executive chairman. In 1953, he and his wife, Edyth, took $200 million worth of company stock accumulated during his career and established the Bush Foundation. Volunteers are the heartbeat of our 26 community foundation partners. Each community assembles a local advisory board to lead its community foundation, raise funds to support the vision, coordinate grant applications and educate the community. These volunteers are building communities through their service. Each person has a unique reason for giving back, like Avis. Read her story. Named for the granite outcrops surrounding the Minnesota River, Granite Falls sits on some of the oldest rocks discovered in North America. It’s postcard pretty, and the community is working to capitalize on the natural beauty, developing tourism and the arts. As the seat of Yellow Medicine County, the local economy currently relies heavily on the human services and health care sector. How does a small town capture a gift like this? With a strong foundation. More than 20 years ago, Granite Falls Area Community Foundation started with the vision of a small group of Granite Falls residents, including community advocate Avis Freitag. Avis and other early leaders had great passion and energy for building an endowment or “savings account” for Granite Falls that would be flexible enough to address local needs and seize opportunities. But they wrestled with the complexity of creating and operating a charitable foundation. Their original attempt in 1993 to organize a community foundation fell flat. But they didn’t let go of the idea. In 2009, a steering committee including Avis and many of those early visionaries was established and, in partnership with SWIF, successfully launched the Granite Falls Area Community Foundation (GFACF). “SWIF was there to educate, guide and, at times, push us along. There is no doubt that without this help we would have been no more successful the second time,” Avis said. As a community fund partner, SWIF processes gifts and grants for GFACF and offers assistance and support. Jeff Vetsch, SWIF Community Philanthropy Officer, works alongside community fund partners and was there to offer guidance to the Granite Falls community throughout conversations with the Bush Foundation. Today, he’s helping the GFACF navigate its new role as a larger funder. With the Bush Foundation’s transformational gift, the GFACF board added three positions to bring its total to 12 volunteers and gain deeper perspective on the community’s assets and needs. There will also be an ad hoc committee established in early 2019 to carefully consider the best use of the short-term funds and give ideas for the larger grants that will be available from the endowment fund. When GFACF gave its first grant in 2009, it was $113 to the Granite Falls Historical Society. Last year, the GFACF had about $220,000 in its endowment, and the board awarded grants totaling about $7,000 to projects including an oven at the Granite Falls Senior Center, new robotics equipment for Yellow Medicine East School District and support services to women to reduce the cesarean rate and increase the rate of breastfeeding. “I like the variety of grants we give out. We’re not just focused on one thing; we are a community-wide foundation,” Peg said. Those grants are one of the reasons GFACF exists, but ultimately its impact is more than just dollars in and dollars out. It’s building community. BUILD YOUR COMMUNITY: Contact your local community foundation to make a gift, volunteer or learn about grant opportunities! Find a complete list of our partners.